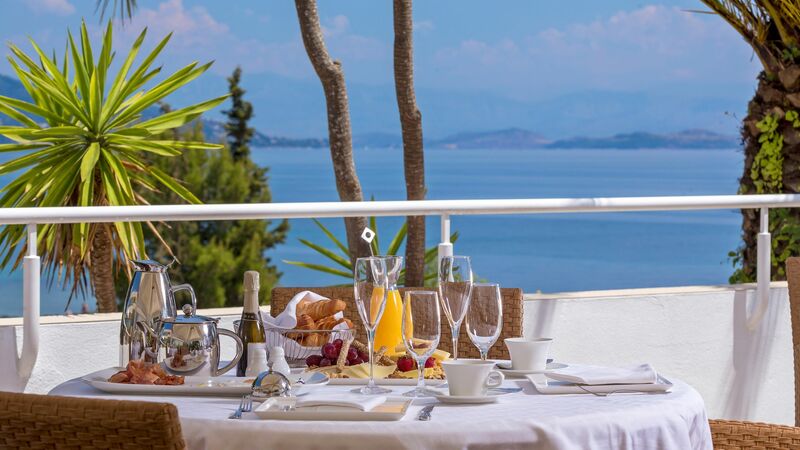 Kontokali Bay Resort & Spa is a luxury hotel located on the golden shore of the Ioanian Sea in Corfu. It has something for both families and couples, with an extensive range of activities offered throughout the day, as well as shows, live music and more in the evenings. When it comes to dining you can taste seafood dishes as you listen to the waves lap the shore or try a modern twist on Mediterranean classics. Each of the guest rooms is bright and spacious, with modern décor and beautiful views available. When it comes to relaxing, the spa offers an extensive treatments menu while the infinity pool is surrounded by loungers and a sun terrace. If you prefer to hit the beach there are loungers available, as well as a wide range of watersports on offer. Hotel child prices apply for ages 2–11 years. The hotel has 261 rooms. Enjoy an excellent choice of options at this Mediterranean buffet. Show cooking stations, themed evenings and more provide entertainment at mealtimes. 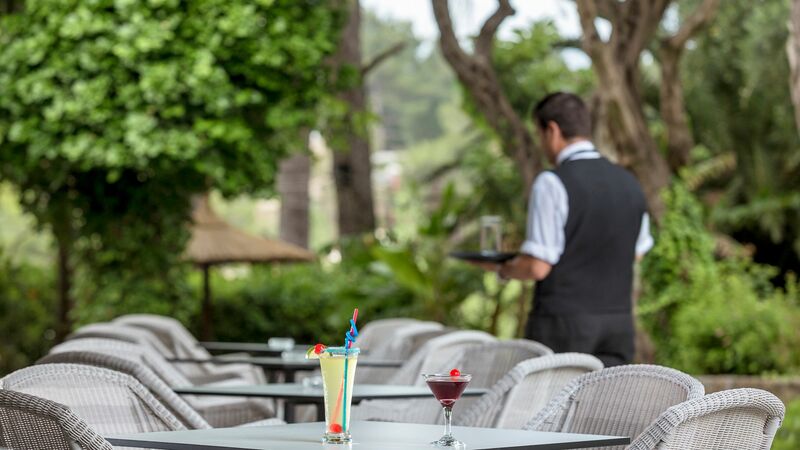 Overlooking the sea, dine al fresco as you choose from pizzas, kebabs, a salad bar and extensive grill menu. 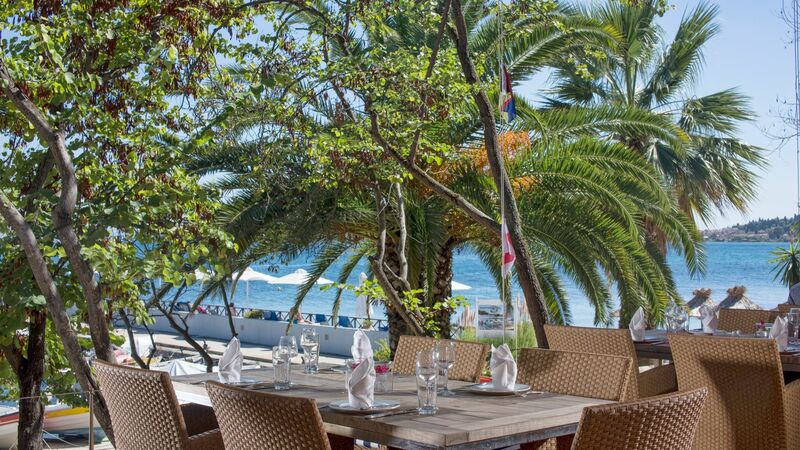 Choose from delicious fresh fish, succulent meats, salads and more as you take in views of the sparkling ocean. Paréa serves food all day, as well as hosting live bands in the evenings. 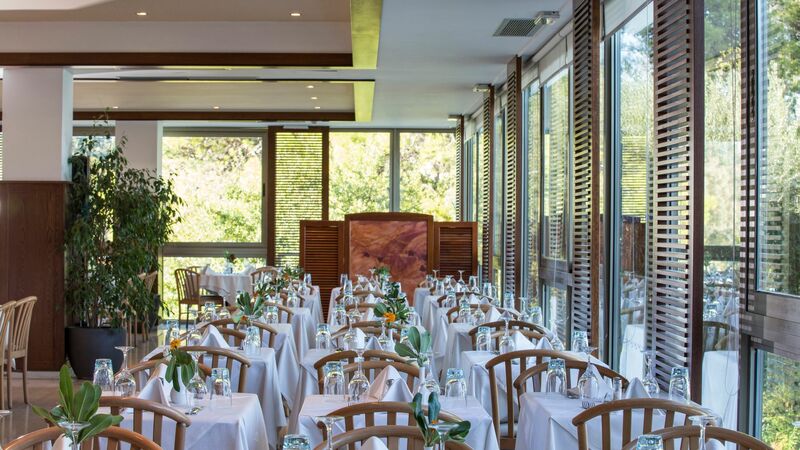 Chef Spiros Voulismas has designed a spectacular Mediterranean menu with modern twists on classic dishes. Choose from light snacks, cool beers, refreshing cocktails and crisp wines throughout the day. In the evening the bar hosts dancing and live music. Relax and unwind in this ambient bar as you choose from tea and coffee, aperitifs and more. Kontokali Bay Resort & Spa offers guests direct access to the beach where you will find the sparkling Ionian Sea, sun loungers, parasols and golden sands. 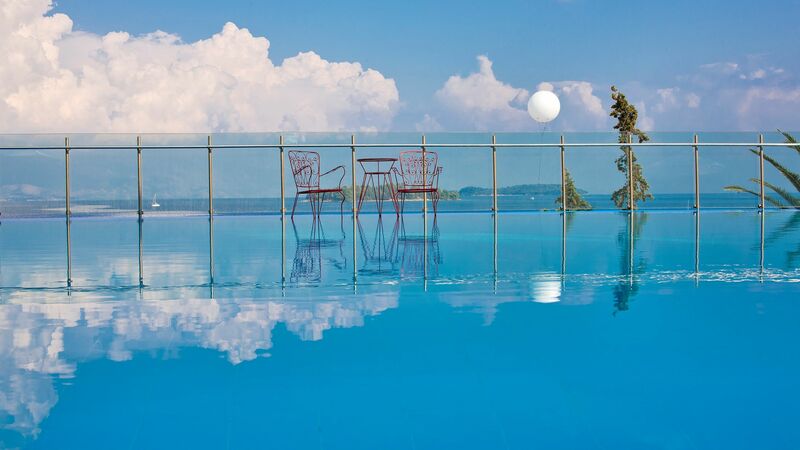 The hotel’s seawater infinity pool is surrounded by terraces and loungers where you can spend the day relaxing. There is also a heated freshwater pool indoors, a freshwater children’s pool and an indoor pool at the spa. Children can play and make new friends while supervised by expert staff at the Mini Club. Activities are run throughout the day in the Children’s Village and include children’s shows, sports and games. The hotel’s onsite spa provides a range of treatments, as well as facilities to help you totally relax and unwind. There is an indoor swimming pool, treatment pool, jacuzzi, steam room and two saunas. 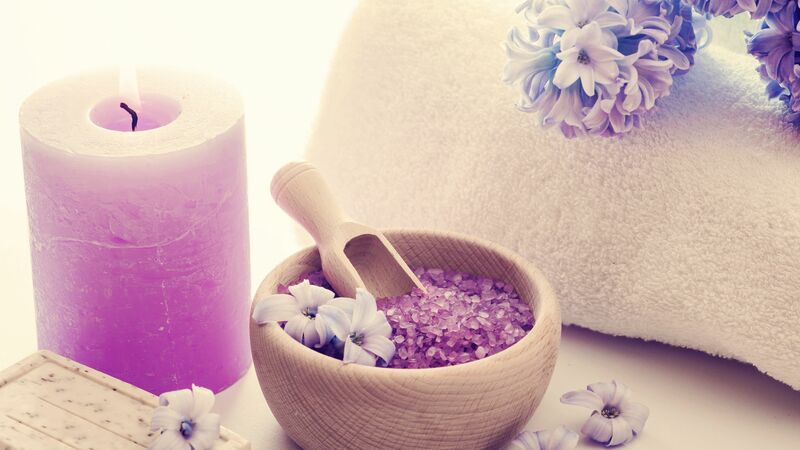 Treatments include massages, body wraps, facials and even hair and nail therapies. Guests under the age of 16 are not permitted in the spa. Guests of the Kontokali Bay Resort & Spa benefit from use of the fully equipped gym where there are both cardio and weight machines. There is also an aqua gym. Guests can choose from a wide range of water sports during their stay, including water skiing, banana boat rides and stand up paddle boarding. Boat rental and scuba diving trips are also available. Keep the whole family active and entertained during your stay with beach volleyball, tennis, table tennis and bicycle rentals all available from the hotel. Adults and children can enjoy specially organised activities, including yoga and morning stretching, hiking, Greek dance courses, aqua aerobics and evening cooking classes. Kontokali Bay Resort and Spa is located on Corfu’s north east coast, in the town of Kontokali. Here you’ll find a huge sweeping bay full of sandy beaches and lapped by the crystal clear waters of the Ionian Sea. Kontokali itself is a small village with pretty, traditional Greek architecture, family run tavernas and friendly bars. Spend your days immersing yourself in the village’s culture and trying exquisite local delicacies. Corfu Town is just a 10 minute drive along the coast and is home to a lively atmosphere, a selection of shops, bars and restaurants and a historic harbour. Admire the luxury yachts or take in the museums and architecture of the town. 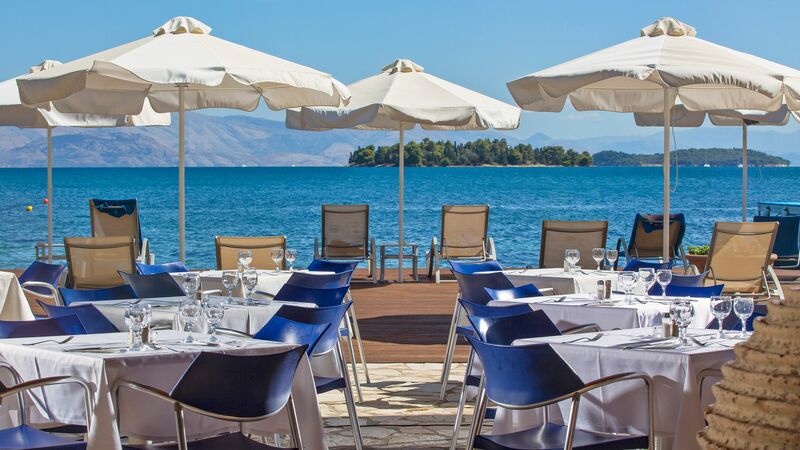 Kontokali Bay Resort and Spa is a 15 minute drive from Corfu Airport. Garden View Main Building rooms feature a double or twin beds as well as a sofa bed for a third person. Bathrooms are equipped with a bath or a shower and outside, there is a furnished balcony or terrace with beautiful views over the lush gardens. Garden View Private Pool Main Building rooms are located on the ground floor and feature a double or twin beds as well as a sofa bed for a third person. Bathrooms are equipped with a bath or a shower and outside, there is a furnished terrace with semi-private pool, two sun loungers and beautiful views over the lush gardens. Sea View Main Building rooms are located on the third, fourth and fifth floor and feature a double or twin beds as well as a sofa bed for a third person. Bathrooms are equipped with a bath or a shower and outside, there is a furnished balcony or terrace with beautiful views over the Ionian Sea. Sea Front Main Building rooms are located on the first floor and feature a double or twin beds as well as a sofa bed for a third person. Bathrooms are equipped with a bath or a shower and outside, there is a furnished balcony or terrace with unobstructed views to the beach and the Ionian Sea. Family Rooms Bay View Main Building are located on the fourth floor and feature a bedroom with a comfortable double bed and a living room with two sofa beds separated by a sliding door. Bathrooms are equipped with a bathtub and outside, there is a furnished balcony or terrace with views over the Marina Gouvia. Superior Sea Front Main Building rooms are located on the ground floor and feature a double or twin beds, writing desk and a couch. Bathrooms are equipped with a bath or a shower and outside, there is a furnished balcony or terrace with unobstructed views to the beach and the Ionian Sea. Garden View Private Pool Bungalow rooms are set in lush gardens, located on the ground floor and feature a double bed, a single bed and an extra armchair, sleeping up to four people. Bathrooms are equipped with a bath or a shower and outside, there is a furnished balcony or terrace with semi-private pool and views over the gardens. Sea View Bungalow rooms are set in lush gardens, located on the first and second floor and feature a double bed, a single bed and an extra armchair, sleeping up to four people. Bathrooms are equipped with a bath or a shower and outside, there is a furnished balcony or terrace with views towards the Ionian Sea. Family Room Garden View Bungalow rooms are set in lush gardens, located on the ground floor and feature a bedroom with a double bed and an additional living room with two sofa beds. Bathrooms are equipped with a bath or a shower and outside, there is a furnished balcony or terrace with views over the gardens. Family Room Sea View Bungalow rooms are set in lush gardens, located on the ground floor and feature a bedroom with a double bed and an additional living room with two sofa beds separated by a sliding door. Bathrooms are equipped with a bath or a shower and outside, there is a furnished balcony or terrace with views over the Ionian Sea. Guests receive a complimentary Upgrade to Half Board when booking any room type on Bed & Breakfast basis for holidays between 17 May - 05 June 2019 booked by 05 April 2019. Stay 7 nights and pay for 6 nights or stay 14 nights and pay 12 nights for holidays between 25 April - 10 May 2019 & 19 - 26 October 2019. Save up to 10% on the hotel price for holidays between 25 April - 26 October 2019 booked by 31 March 2019. Guests 16 years old and over can enjoy a 15 minute massage per person per stay for holidays between 25 April - 26 October 2019. The minimum age to access the Spa Circuit is 16 years. The offer is based on two persons and the package cannot be transferred to another person. This packages is subject to availability and not combinable with any other offer, except the Early Booking Discount. 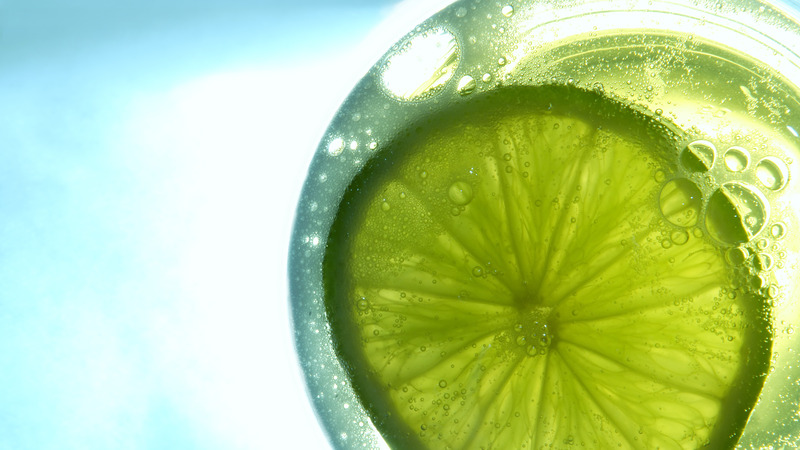 - one bottle of mineral water & one bottle of wine (750ml) per room upon arrival. - welcome drink, bathrobe & slippers, full set of toiletries, safety deposit box, internet access throughout the hotel, one sunbed & parasol at the beach or pool (beach towels available). - use of the tennis court (flood-lit excluded), entry to the Kontokali Bay Spa for the use of the indoor heated swimming pool, Jacuzzi, Hammam, saunas, aqua-gym exercise and the gym. Suite Guests also receive a fruit basket, fresh flowers, luxury VIP toiletries and personal guidance upon arrival. Daily amenities include fresh flowers, fruit basket, mineral water and an evening turn down. We booked a bungalow for.one night. It was fantastic value for money, an excellent and spacious room, an extensive breakfast buffet in the restaurant with a great view (shown). We look forward to coming back! We booked family room with a bay-view for 2 adults and 2 kids. Room was nice, clean and the view at the bay was lovely. Upon arrival we got a free bottle of red wine (thanks to the hotel), however it tasted like a wine that you would buy for ?? ?1,5 in a local supermarket. Breakfast at the hotel is really nice. Good variety of food. Enough for everybody to choose from. As this was the end of the tourism season (last week of October), you could feel that the hotel staff was slightly tired and looking forward when the hotel will close. We had some unpleasant experiences with the stuff, where instead of providing a service, were pointed with a finger in a direction for us to go and look for service ourselves. Some of the equipment at the hotel would need an upgrade (e.g. game room, ping pong table and equipment, etc) as it doesn't fit in what the hotel claims to be be a 5-start place. Also, almost no activities were offered for the hotel quests (except some stretching and joga). As the weather outside wasn't so hot anymore, kids wanted to use swimming pool in SPA center (according to the rules, kids are allowed only from 12:00 - 14:00). They claimed that the water temperature was +28C, however other guests also complained that the water temperature was way lower and staff at the SPA continued arguing with us that we were not right. Having traveled quite a few places and stayed at many hotels, I could rate this as a decent 4-start hotel. Stunning Location, excellent staff and Facilities. Can't praise this Hotel enough. They just want you to have A great stay! Fully recommended to friends and family already. A free Shuttle bus goes into Corfu town each day. The local buses run regularly too at 1.70 each way. The hotel beach is kept spotless and there is no fighting for the sun loungers either. If you are hungry or thirsty just ring for beachservice. Do yourself a favour and book this hotel.